Mey Selections - the premium product brand launched just over a year ago - was commended in the New Business Award category at the second Highlands and Islands Food and Drink Forum Awards, 2006, held at the Drumossie Hotel, Inverness. 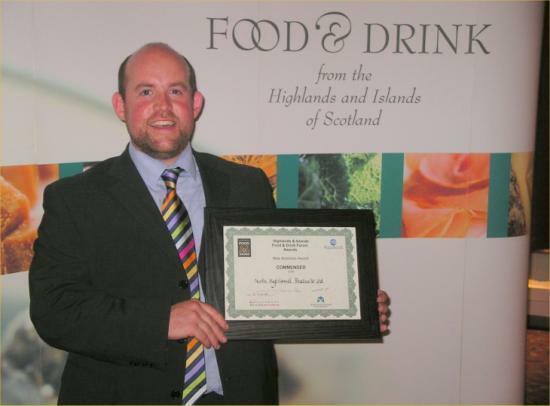 The Award, sponsored by Aquascot Ltd, was presented for the contribution that Mey Selections has made to the North Highlands food and drink economy. North Highland Products Ltd, the company formed as part of the North Highland Initiative set up by His Royal Highness The Prince Charles, Duke of Rothesay, began trading in October 2005, selling only beef, lamb and other products produced within 100 miles of the Castle of Mey. Danny Miller, chairman of North Highlands Products, who accepted the commendation, said he was delighted at the success of the brand. "In just over a year, we have come a huge distance, gaining premiums for our farmers and generating added value for our traditional top quality beef and lamb. In this short time Mey Selections is now known for its premium quality and consumers recognise the value of the brand. "The premium payments to farmers for their beef and lamb would not have been available without creating the brand and the money earned goes straight back to them as additional income. We are committed to developing this new completive supply chain for our produce from the North Highlands. "In our first year of operation, we have surpassed our original projections and we are very confident of the future." In the three months to the end of 2005, North Highland Products reported a turnover of �1.2m, of which �60,000 comprised extra premium payments for its farmer members. It is expected that turnover in 2006 will be over �4m with farmers securing �250,000 in premium payments - income which they would not have otherwise received. Over 150 farmers supply beef and lamb to NHP and around 100 cattle and 350 lambs per week are currently traded. Dunbia, the Mey Selections meat processor, has invested over �150,000 at its plant in Dornoch, creating 17 new jobs. increasing number of Sainsbury's stores. It is planned that sustainable supplies of fish and shellfish, including oysters, will be added to the Mey Selections brand. "The award recognises the contribution that Mey Selections has made to producers to the region - and will increasingly make in the future," says Danny Miller. "